Cage Dive with big sharks in the Bahamas! 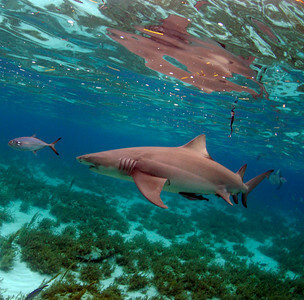 You don’t have to be a certified diver to get in the water with Tiger Sharks, Lemon Sharks, and Reef Sharks. 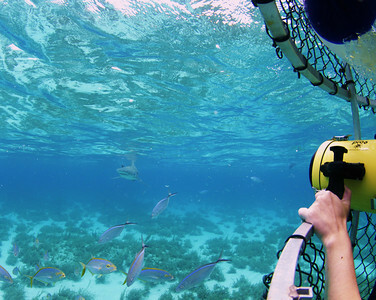 If you snorkel, you can cage dive. Our certified dive instructor will teach you everything you need to know! We’ll take you to the very special place divers call “Tiger Beach” for an incredible day of cage diving. Located roughly 20 miles offshore, the spot is known as the underwater hangout of some very big Tiger Sharks, Lemon Sharks and Reef Sharks. You may have seen a shark cage on TV. Our shark cage floats at the surface and there’s no need for cage divers to wear bulky air tanks. Air is supplied by a hookah system on our dive boat. If you haven’t seen one before, a shark cage is a special metal enclosure designed to keep dangerous sharks a safe distance away from divers. It protects humans from sharks much the same way a bird cage protects a pet parakeet from the family cat. A shark cage allows divers, researchers and film crews to view and photograph ocean predators with a certain degree of safety. Best of all, you can focus on getting the perfect photograph without worrying about what’s swimming behind you. Our Tiger Shark Adventures depart from Old Bahama Bay Marina, roughly a 40 minute drive from Freeport and Port Lucaya on the West End of Grand Bahama Island. Several commercial airlines fly into Freeport, or you can reach the island by boat from Florida. For a list of available dive dates, call 800-644-7382 or 941-346-2603.